From a holiday based around a pun to a celebration of all things drag, May is chock-full of good stuff to do. Science says the best way to spend Cinco de Mayo is by eating lots of tacos and drinking lots of beer. Head to Pershing Square, where you’ll be able to do both while enjoying live mariachi music and a mechanical bull. Considering the number of margaritas and micheladas you’re bound to consume, leave your car at home and Metro right to the action. Graffiti historian Roger Gastman—who helped orchestrate MOCA’s record-setting Art in the Streets show in 2011—takes over a 40,000-square-foot warehouse on the edge of Chinatown for a totally bonkers street art experience. See works from more than 100 artists, including marquee names like Jean-Michel Basquiat and Jenny Holzer, plus live performances and lectures. Maybe you skipped Lin-Manuel Miranda’s historical hip-hop smash at the Pantages last year. Or maybe you saw it three times. Either way, don’t throw away your shot (yup) to catch it again at Costa Mesa’s Segerstrom Center for the Arts—because you can never be in the room where it happens (not sorry) too many times. Put the phrase “Yas, kween!” to good use at the L.A. Convention Center, where you can kiki with your favorite Drag Race contestants, master the art of the wig, and watch Look Queens battle Dance Queens on the runway. Between events, peruse everything from wholesale rhinestones to art dolls from more than 300 exhibitors. 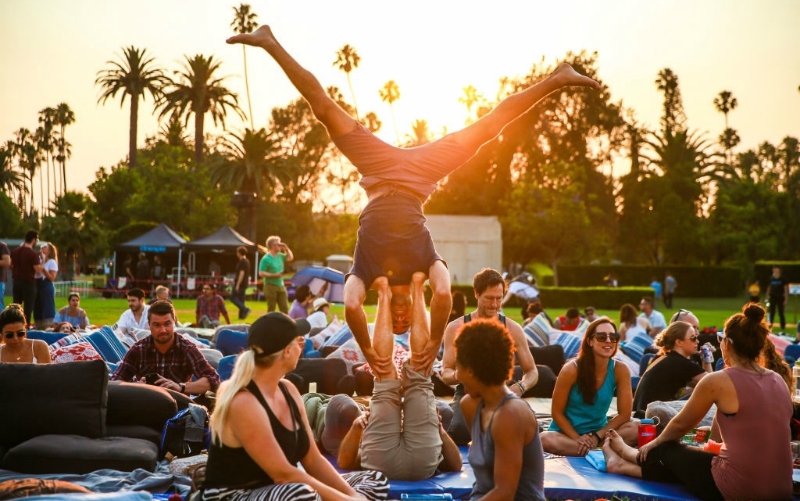 Parking’s a nightmare, but Cinespia’s programming at Hollywood Forever Cemetery is too good to pass up. Kick off summer screening season with a showing of The Never Ending Story followed by Drive, Almost Famous, and Casablanca. As usual, BYO games and picnics are encouraged. If you think tearing up at home—from laughter or otherwise—while reading David Sedaris is embarrassing, try doing it in the middle of a packed auditorium. The renowned essayist returns to the Soraya in Northridge to read wildly varied anecdotes from his memoirs and diaries. Expand your outdoor concert horizons with wine in hand at Malibu’s Peter Strauss Ranch amphitheater, which hosted Johnny Cash way back when. Bring a picnic and your (low back) lawn chairs to its summer concert series, beginning with a performance from the Eagle Rock Gospel Singers. There’s kindergarten macaroni art, and then there’s the Hammer’s Kids Art Museum Project. Little ones participate in workshops run by architects, musicians, painters, and other local art pros before plopping into beanbag chairs for story time with Jimmy Kimmel, Kathryn Hahn, Kristen Bell and Bill Hader. Mid-Wilshire holds the Museum Row crown, but Northeast L.A. and Pasadena have plenty to offer. Try to knock out six art institutions in five hours when the Autry, the Gamble House, the Heritage Square Museum, the Los Angeles Police Museum, the Lummis Home and Gardens, and the Pasadena Museum of History open their doors for free. It’s not exactly the Big Easy, but the Simi Valley is a helluva lot quicker to get to when you’re craving a bit of New Orleans. Zydeco bands, Mardi Gras parades, and jambalaya are on tap at this Creole-style celebration, plus a few less traditional performances—Eddie Money is headlining, and yes, he’s got both of your tickets to paradise. Next articleIn the War Over Waze, Will Rich Angelenos Demand Private Streets?